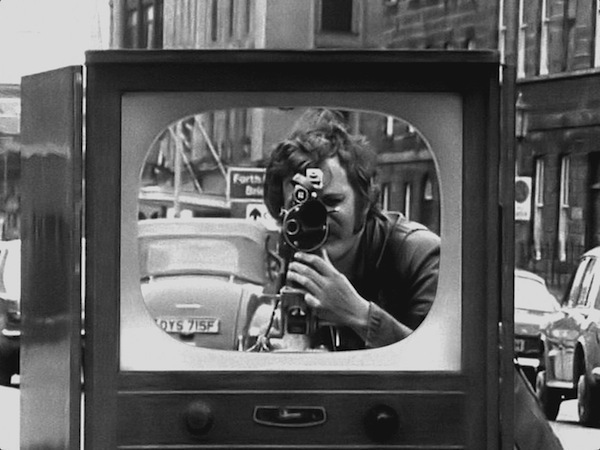 David Hall, TV Interruptions (TV Shoot-out Piece), 1971. © Deborah Hall/Estate of David Hall. These words, spoken by the well-known BBC newsreader Richard Baker at the start of This is a Television Receiver (1976), announce the primary concern at the heart of David Hall’s work. Hall, who passed away in October at age seventy seven, was already a successful sculptor when he began working with 16-mm film and later video, the medium for which he would become a key spokesman, curator, and historian. Throughout his career, Hall approached the moving image and its various containers, in a sense, sculpturally, emphasizing the plasticity of video and the TV set’s material properties. With This is a Television Receiver, an update of his 1973 This is a Video Monitor for a special episode of the BBC’s program Arena, Hall presents a pedagogically materialist work in which the newsreader explains the technical and social affordances of the medium while his voice and image gradually deteriorate, his recorded likeness slowly blurring into abstraction as it’s subject to successive copies. The result is a witty demonstration of the specificities of video as a medium, but, like Alvin Lucier’s 1969 I Am Sitting in a Room , it makes perceptible a process of audiovisual decay: video’s ephemeral signal made corporeal. Left: David Hall, TV Interruptions (Interruption Piece), 1971. Right: David Hall, TV Interruptions (Tap Piece), 1971. © Deborah Hall/Estate of David Hall. Hall’s “interruptions” are, by design, very much of their medium rather than against it, offering other possibilities for the televisual experience rather than a militantly “antitelevision” one. He saw his work as reflexive without being oppositional—to address and challenge the medium’s affordances without falling, as he put it, into the “reductive anti-illusionist cul-de-sac.” “Video as art largely seeks to explore perceptual and conceptual thresholds,” he wrote in 1978, “and perhaps incidentally, perhaps intentionally, and implicit in it is the decoding and consequent expansion of the conditioned expectations of those narrow conventions understood as television.” By the time MTV commissioned a new set of five interruptions in 1993, it seems the kind of “break” that Hall had in mind had already become a part of the viewing experience—fully incorporated, for better or worse, into television’s flow. Nonetheless, opportunities on broadcast television were few, and much of Hall’s most indelible work found expression in installation, where he could explore television’s inherently sculptural dimensions and its ambiguously interactive relationship with the viewer. Hall called his work “a complex analogical mirror where the viewer interacts with his/her image as collaborator rather than spectator,” and many of his works make this metaphor literal, such as Vidicon Inscriptions, 1973/75, which makes use of video’s capacity for real-time image-making through the use of ghostly traces of light burnt into the tube’s photoconductive signal plate. TV Fighter (CAM-ERA-PLANE), 1977, also plays with the experiences of real-time and the video copy, presenting in several iterations a fragment of World War II footage taken from the point of view of a fighter plane as it machine-guns targets on land and sea. Using a Russian-doll structure of images repeatedly rerecorded and reframed, Hall toys with the viewer’s manifold experiences of live and recorded time: the historical time of archival footage, the live experience of watching it on a screen, the déjà vu of watching that “live” footage again on another monitor. This nesting of recorded images within other recorded images implies an emergent sensibility in which the present moment is continually being recorded and reframed by audiovisual apparatus, but crucially Hall’s approach to this phenomenon is as playful as it is provocative. David Hall, 1001 TV Sets (End Piece), 1972-2012. Installation view, Ambika P3, University of Westminster, London, 2012. Hall’s most imposing evocation of television’s material presence comes in his “TV Sets” series. Originally a collaboration with the artist Tony Sinden, the installation was first shown as 60 TV Sets in 1972, then grew to 101 TV Sets for “The Video Show” three years later. A room full of television monitors, each blaring out its own signal, has become a familiar sight on the showroom floors of electronics stores the world over, but for our era of ubiquitous computing, wearable technology, and mounting quantities of technotrash, it also functions as an index of the television monitor’s rapid penetration into every corner of midcentury life, both physical and psychic. Hall revisited the piece for the University of Westminster’s Ambika P3 gallery in 2012—now with 1001 CRTs and re-subtitled End Piece. 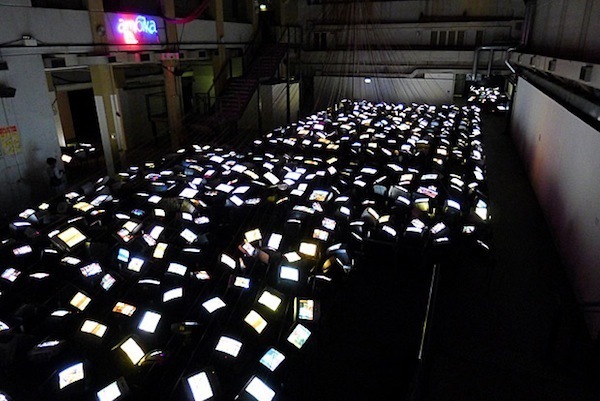 The installation took on a new elegiac tone during Britain’s transition to digital television broadcasting between April 4 and 18 of that year, when the screens’ audiovisual melee gradually became a monotonous hiss as the last analog signals were broadcast from London’s Crystal Palace. An era had ended, but its material presence may last for thousands of years. Leo Goldsmith is the editor of the film section of the Brooklyn Rail and a PhD candidate in the department of cinema studies at New York University.